Knee pain is a commonly encountered complaint along a multitude of settings, including primary care, urgent care, emergency medicine and orthopedics. Today, we will review one of the most common orthopedic knee injuries as well as discuss pearls associated. 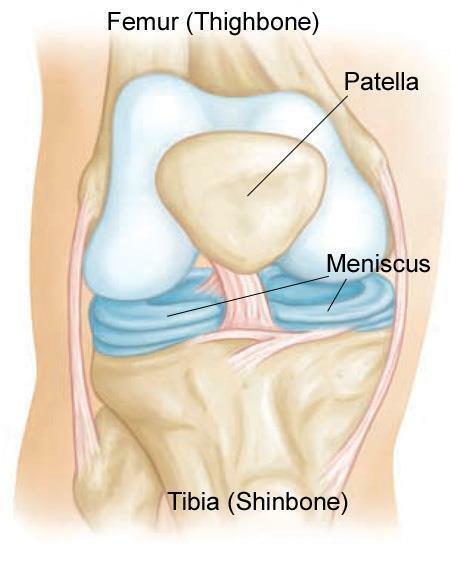 As we will recall from our clinical anatomy course, the meniscus is a cartilaginous structure that is located in the knee joint between the medial and lateral femoral condyles. The meniscus itself is composed of a body, anterior horn, posterior horn. The medial meniscus is attached to the MCL. The function of the meniscus is to provide stabilization for the knee during movement, aid in lubrication of the joint in general, and distribute force across the knee (Schwartz, 2016). In older patients, meniscus tears are more likely to be chronic and due to degenerative changes. Overall, tears are more common in patients between age 30 and 50. The medial meniscus is more commonly injured due to its’ reduced mobility. Traumatic tears related to sports are more likely in patients less than 40 years of age, with up to 90% during athletic competition, making it one of the most common orthopedic injuries. In terms of mechanism of injury, the meniscus is usually torn via a twisting motion of the knee while the foot is planted. It is also possible with hyperflexion of the knee. It is important to note that in older patients, even minimal trauma can tear the meniscus. Risk factors for a meniscus tear include older age, obesity, and athletics. Sports that are high risk include soccer, basketball, and football as there is a high amount of pivoting while the foot is planted, which is the main mechanism for injury. The history may illicit a recent injury, or in older patients, the injury may not be as clear. As discussed above, there may be a history of noncontact twisting or hyperflexion. Swelling typically does not manifest until about 24 hours post injury. Patient may complain of knee pain on the impacted side. Pain may be worse with climbing stairs or squatting. The patient may complain of a sensation of “locking”, audible popping. Patients may also complain of a sensation of the knee “giving out”. Pain and instability may be worse with ambulation over an uneven surface. The examination of the knee is very important and should be mastered by all clinicians, particularly those who encounter orthopedic complaints frequently. Observing the patient’s gait initially is helpful. Inspection for effusion, swelling, or deformity can be accomplished while the history is taken. Palpation in the quadriceps, pre-patellar bursa, patella, and other areas of the knee should assess for pain, fluid, or presence of effusion. Presence of medial or lateral joint line tenderness can help narrow down the diagnosis. The McMurray’s test is performed with the patient laying on their back. The knee is grasped, and pressure is placed over the joint line. The leg is elevated and the examiner then rotates the foot to provide Varus or valgus stress on the knee. A positive test is an audible click or the patient endorsing pain in the area. The Apley grind test is performed with the patient laying on their stomach. The patient then flexes the knee to a ninety-degree angle and the examiner provides downward compression on the tibia in a “grinding” fashion. Pain is a positive test. The differential, depending on patient presentation and age, includes ACL tear, MCL/LCL tear, fracture, osteoarthritis, rheumatoid arthritis, and gout. Although clinical exam can point toward a meniscus tear, the definitive test for diagnosis is the MRI. A plain film radiograph can rule out fracture if there is significant concern for trauma. A tear on MRI is identified by increased signaling in the meniscus. Interestingly, many meniscus tears are incidental and found on MRI because many tears in older patients may be chronic and asymptomatic. The hallmark of treatment for a meniscal injury is rest, ice, compression, and elevation. Activity certainly should be limited during the acute setting. Intra-articular corticosteroid injections are a possibility for patients with degenerative tears.Small tears may be asymptomatic or may heal on their own. NSAIDs are first line therapy. Surgery should be considered in specific settings, particularly in young patients with athletic injury, or with other concomitant ligament injuries. Physical therapy is important in the pre-operative and post-operative setting. A meniscectomy can remove the injured tissue, but is not without risks, as this can contribute to osteoarthritis later in life. A repair can be performed with surgical fixation, which is more desirable. For athletes, the discussion is always related to return to play. For patients returning to sport, they should be pain free, have good strength via physical therapy, and can generally return to play in 3 to 6 months, depending on the nature of the tear. Schwartz, Jennifer (2016). Meniscal Injury. The 5 Minute Clinical Consult. Wolters Kluwer.